It’s 1966 at Yesterland. The parade is starting. Let’s watch from a spot across from the INA Carefree Corner, the guest registration lobby sponsored by INA (Insurance Company of North America). The parade is Fantasy on Parade. It will march down Main Street U.S.A. and Frontierland twice today, with parade units pausing along the route to give performances. Pinocchio unit with an actual, live circus bear! So far, this parade hasn’t been very Christmassy. The photographer didn’t take photos of every parade element. (Film is expensive, and he did a great job getting as many photos as be did.) The elements be missed weren’t Christmassy either. That makes sense. This is Fantasy on Parade, not Holidays on Parade. But the rest of the parade will be more Holidayish. The parade continues with Santa’s silly, cross-eyed reindeer. 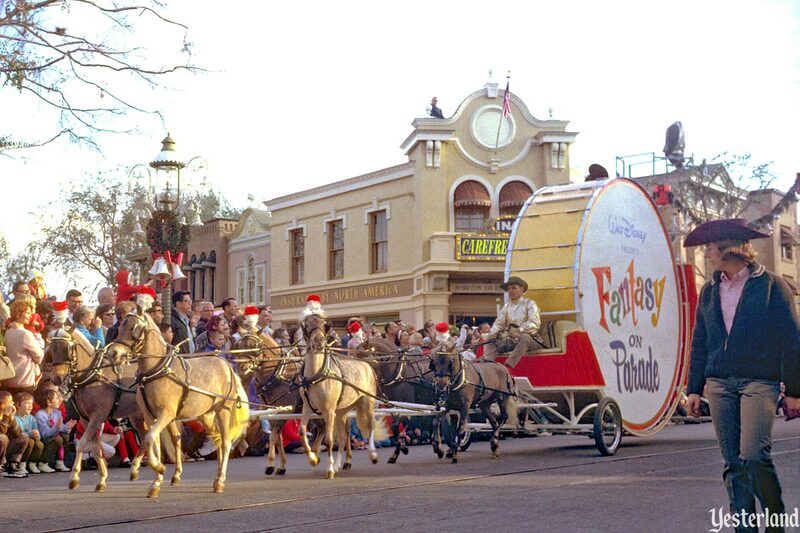 Then, Fantasy on Parade concludes with Santa Claus waving from his sleigh atop a custom parade float. Sorry. The photographer missed those. Perhaps he used too much film getting photos of the harem dancers. 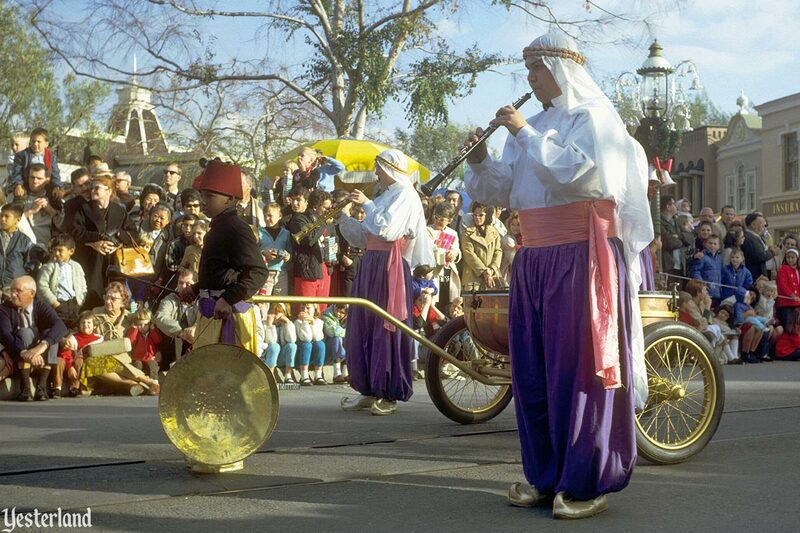 During Disneyland’s first six Christmas holiday seasons, there had been some parades as special events—but daily scheduled holiday parades became an annual tradition at Disneyland in December 1961 with Parade of Toys. 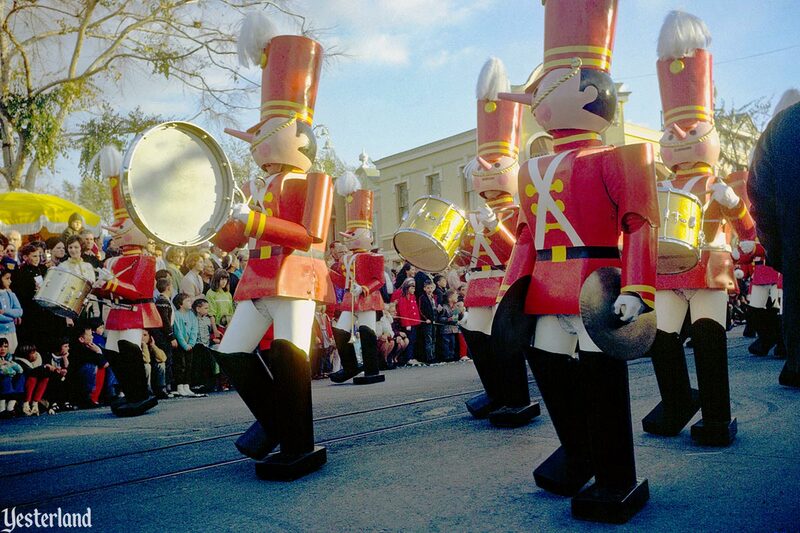 Along with other parade elements, many not themed to the holidays, Parade of Toys used props and characters from Walt Disney’s 1961 holiday release, Babes in Toyland—notably the wooden toy soldiers which have been a Disney holiday tradition ever since. 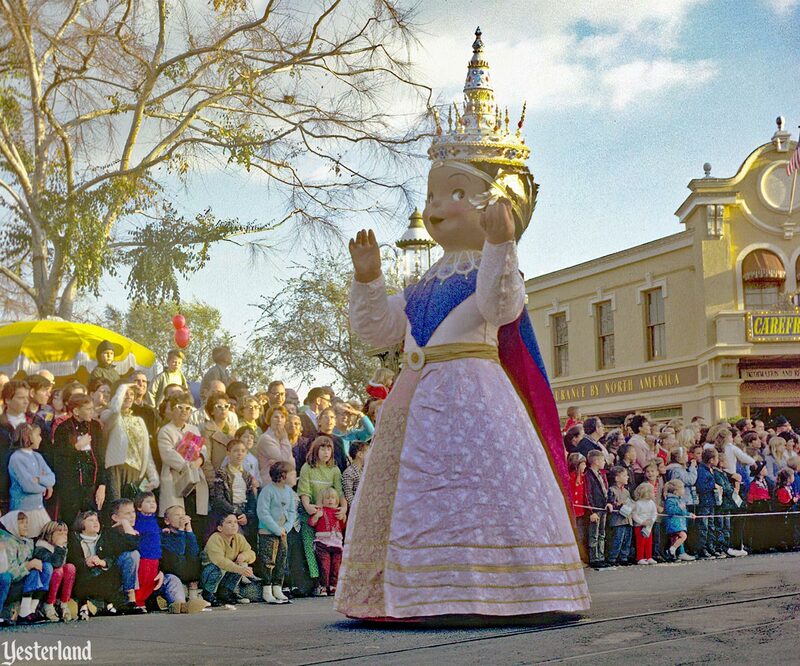 Each year, the parade evolved. 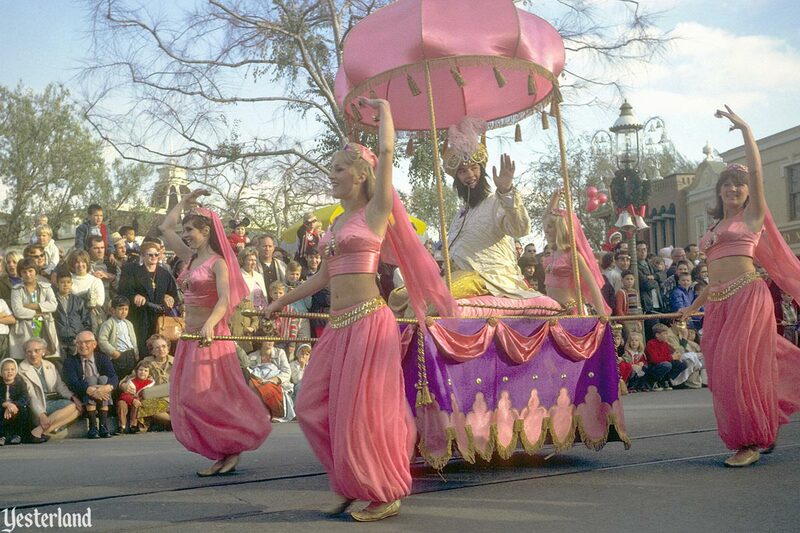 Fantasy on Parade, the subject of this article, was the name of the holiday parade at Disneyland from 1965 to 1976, and again from 1980 to 1985. 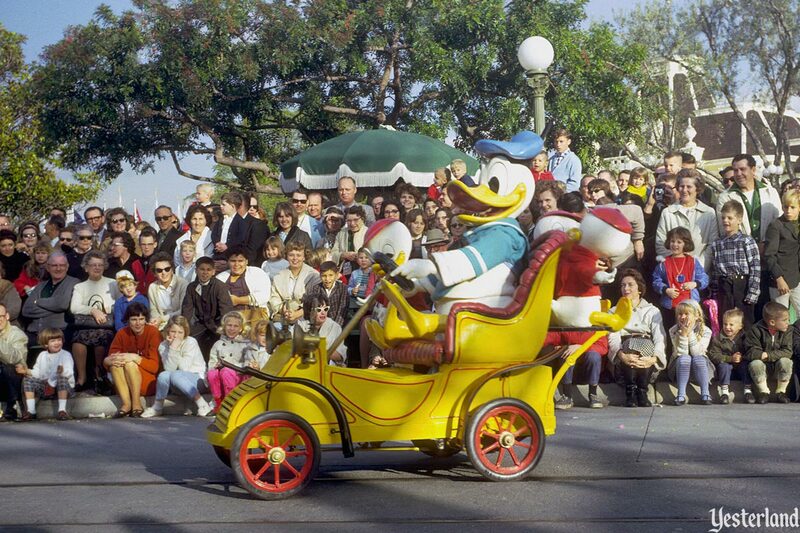 Although it was billed as a new parade, it reused many popular elements from Parade of Toys. And it continued to evolve. 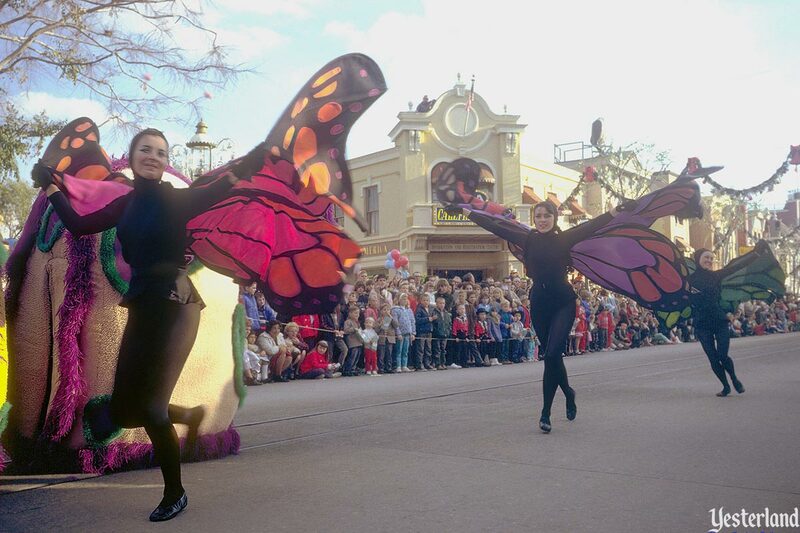 The Gala Premiere of Fantasy on Parade was 8:00 p.m. Saturday, December 18, 1965. 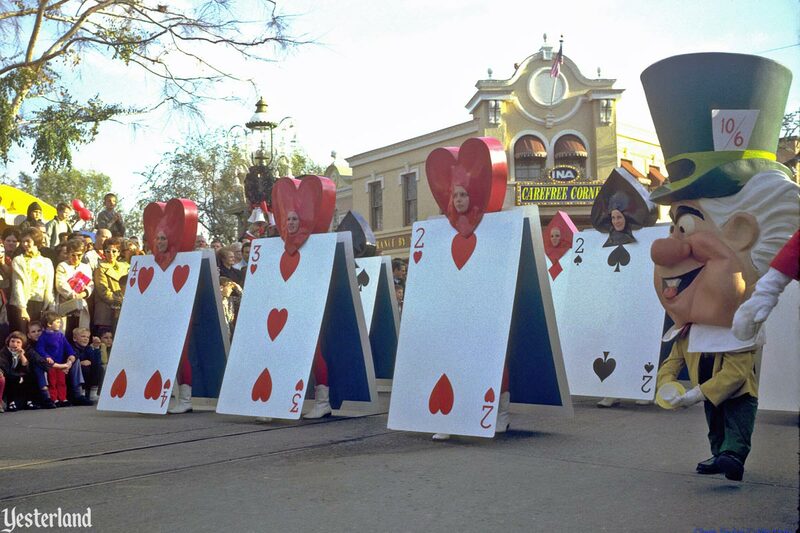 Twice-daily performances began the next day and continued through January 2, 1966. That’s right. The Christmas season at Disneyland was just two weeks. It was not such a big deal in those days. Park hours on Monday through Friday of the week leading up to Christmas were 10 a.m. to 6:00 p.m., with Fantasy on Parade at 1:00 p.m. and 4:00 p.m. If you think of Disneyland as a 12-month-long Christmas, as all us middleaged kids do, you wonder how it can top itself during the season itself. But its twice-daily, hour-long Fantasy on Parade achieves this, to the shrill satisfaction of the genuine chronological kids who attended with me Sunday afternoon. 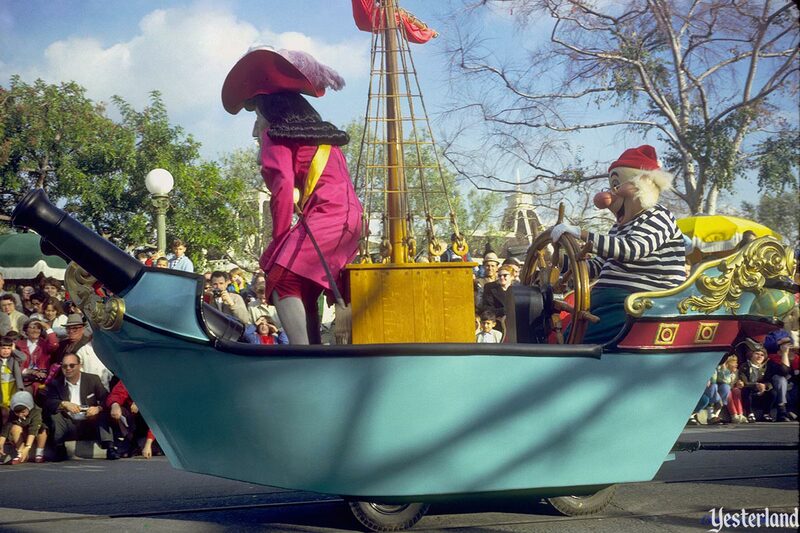 The ingenuity of the Disneyland designers remains endless and amazing. 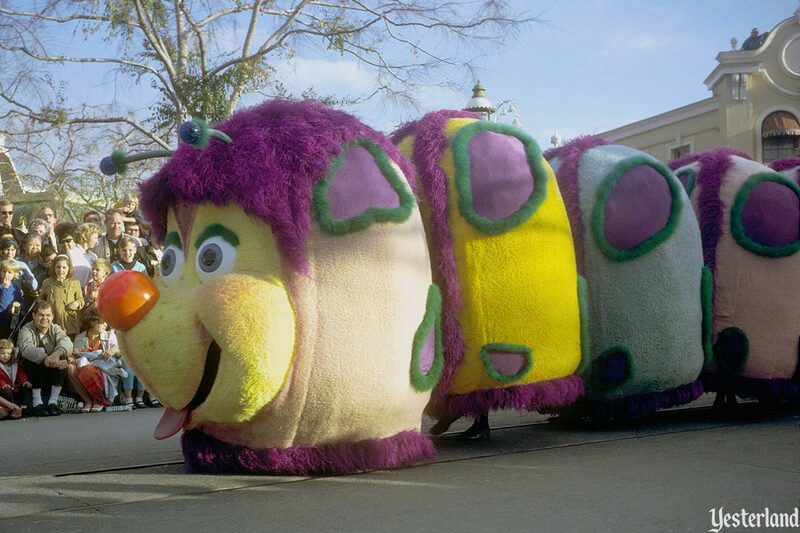 A long lavender caterpillar deploys winged butterflies who do a dainty little dance before caterpillaring up Main Street again. The wooden soldiers and their band really look like wooden soldiers. 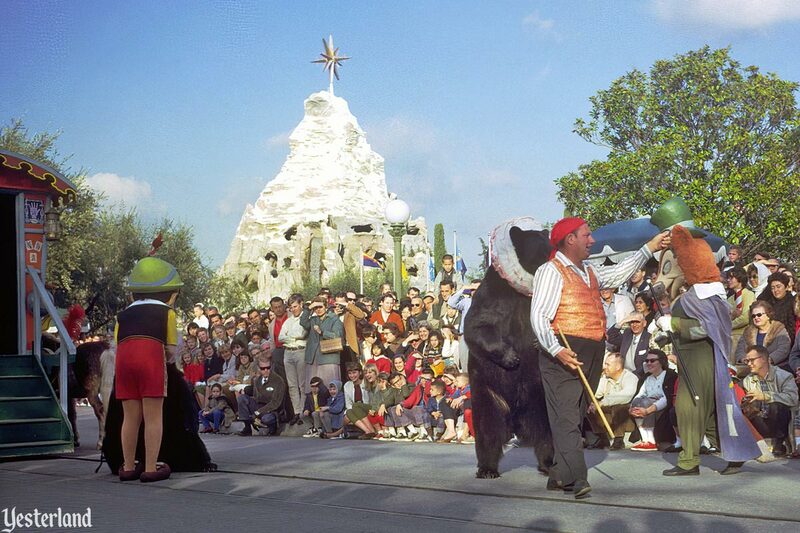 Beyond the Disney standards, there are fine performing dogs and dancing bears. Goofy performs with a delightful trick car and Mickey himself beats the world’s largest bass drum. Santa himself is strictly traditional, jollitywise, but his prancing reindeer, tinkling and silly, are out of the Burbank tradition and very nearly upstage the old gent, the ultimate compliment to the Disney magic. All in all, it’s a whizbang caper and likely to give the Anaheim pleasure dome a very populous holiday season. Walt Disney died December 15, 1966. Disneyland remained open. The 1966 edition of Fantasy on Parade, featured in this article, premiered two days later. 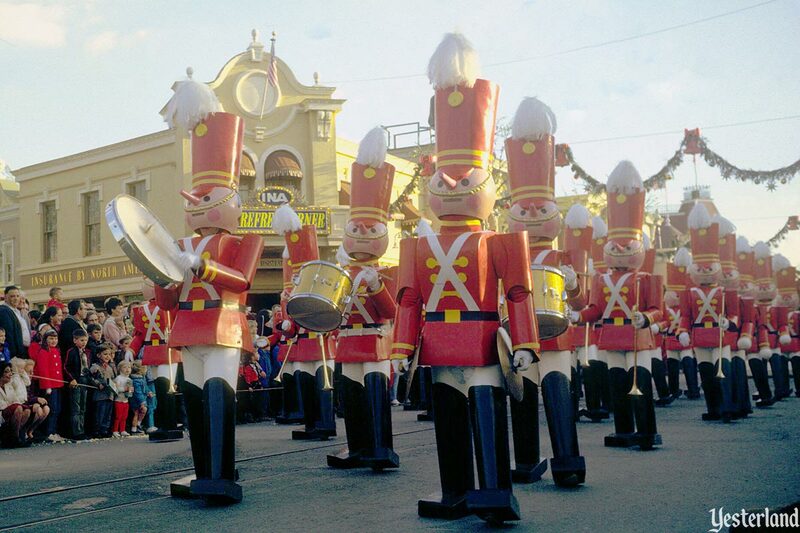 For the 1977, 1978, and 1979 Christmas seasons, the parade’s name changed to Very Merry Christmas Parade. 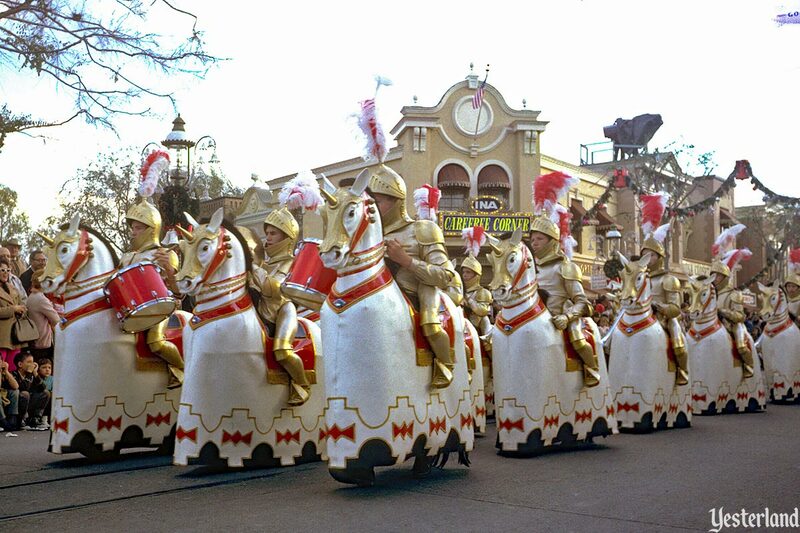 For seven seasons beginning 1980, the name reverted to Fantasy on Parade, but the actual parade did not revert. It continued to evolve. 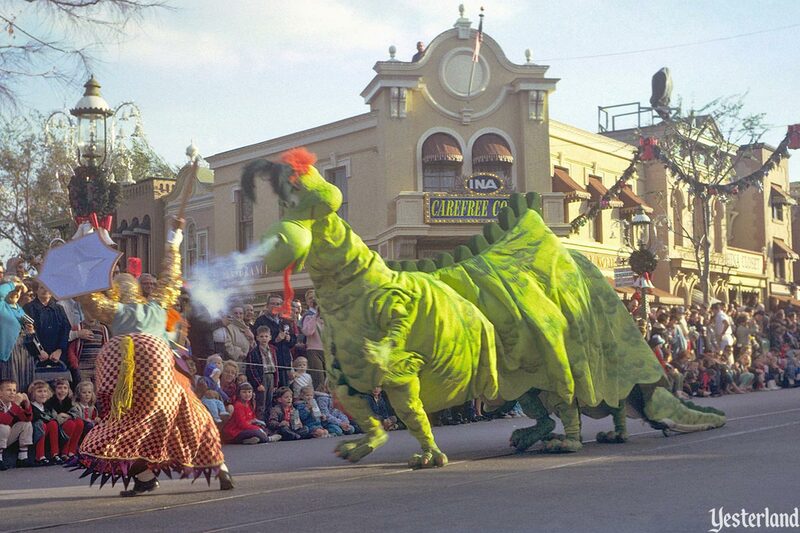 In 1987, the name again became Very Merry Christmas Parade. 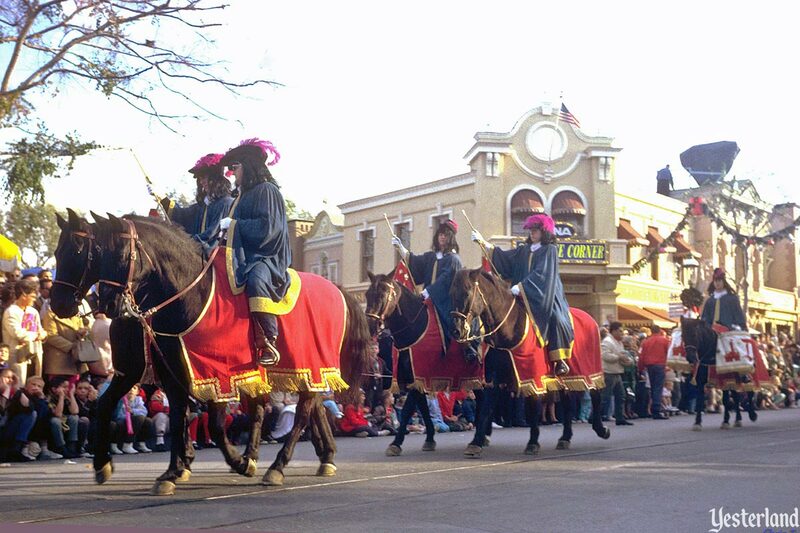 For the 1994 season, the parade received its current name, A Christmas Fantasy Parade. 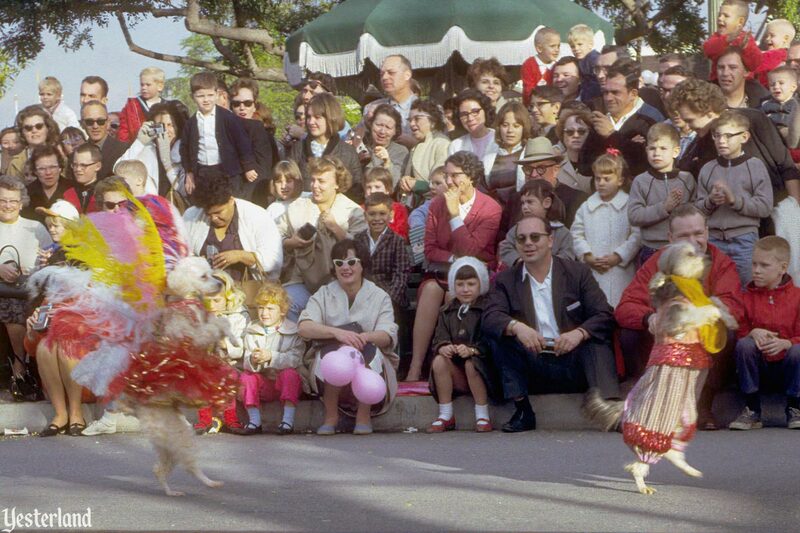 By then, the parade had become entirely holiday-themed. The parade’s run of two weeks each year has grown to a run of almost two months for the 2017 edition—November 10, 2017, through January 7, 2018. How much longer until it begins right after the Labor Day weekend?